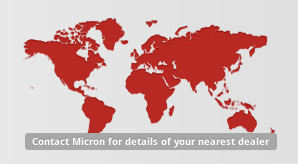 The Micron PRECISDOS has been developed to make the job of bracken spot-treatment easier and less tiring. 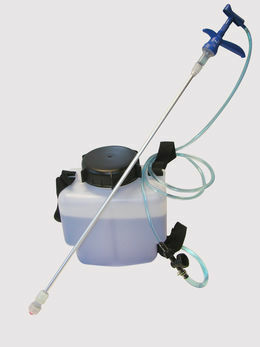 As little as 0.1ml of spray mix can be applied per frond so that 5 litres of mix can treat some 10,000 fronds. A team of 4 people equipped with the PRECISDOS and working a 12 metre width can treat an acre of rough ground in some 20 minutes - an efficient method of dealing with large areas of bracken even in remote areas. A red dye, also available from Micron Sprayers Ltd., can be added to the mix to help distinguish between treated and untreated fronds. The PRECISDOS spot-gun is also useful for precision spot-treatments of bracken in sensitive conservation areas, for reclamation of heather from areas of sparse bracken, and for treatment of advancing fronds - always a priority when dealing with bracken encroachment. Spot-applications are essential when dealing with areas of sparse bracken, especially following a primary treatment aimed at bracken clearance. Bracken fronds always re-grow after primary spraying or wiping and subsequent spot-applications are required to deal with these small fronds in the years following initial treatment. Clearance of entrenched bracken with complex rhizome structures may require some 6 - 10 years of repeated, annual spot-treatment before re-growth ceases. 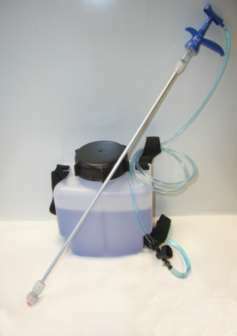 The PRECISDOS is also ideal for many other spot-treatments around the farm, orchard, paddock or wayside for controlling thistles, brambles, docks, ragwort, nettles and other problem weeds.